The concept of a Mind-Body connection has been all over the news lately, but have you heard about the Tooth-Body connection? If you’re familiar with Chinese Medicine or acupuncture, then you’ve heard about meridians… the channels through which energy flows in the body. 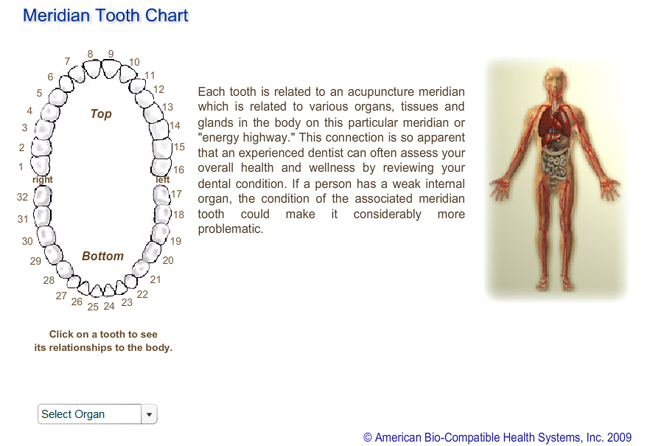 Each organ, gland and body structure has an associated meridian… including the teeth. All the body structures on an individual meridian can be affected when energy flow through that meridian is altered or blocked. Energy flow can be altered in a meridian when an organ on that meridian is diseased or infected. Well, if you have a bad tooth, the energy flow through the meridian belonging to that tooth will be altered. This in turn can affect the health of all the other organs on that meridian. For example, the upper right first molar tooth is on the same meridian with the liver, kidneys, pancreas, stomach and breast. So, if this tooth has a problem it may affect energy flow through the meridian and the health of your liver, kidneys, pancreas, stomach or breast may be affected as well. Please DOWNLOAD Flash player for the chart to work and ensure your anti-virus program is NOT blocking the Flash player.